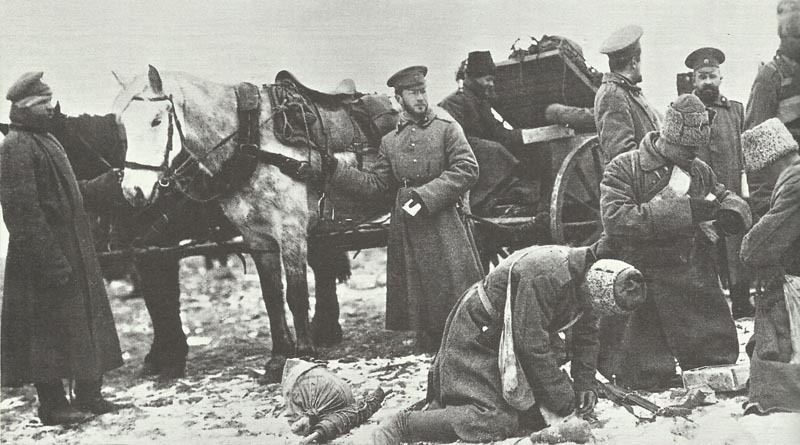 Russian troops receive supplies of ammunition. Although numerically strong, the Russian Army was short of many basic military necessities. Poland: Russians advance on Lower Vistula until January 16, occupy Serpets north of Plotsk. Aisne: Germans storm Hills 132 and 159 with Vregny heights; French retreating across river until next day. Britain: British War Council together with Field Marshal French decide to prepare a naval attack against the Dardanelles in February and asking for French support on January 18. BEF VC and DSO Buckingham Palace investiture. Britain: Abortive German Navy airship raid on East Coast in night of 13-14 January; adverse weather and mechanical problems.